Check box is another common element of any native, hybrid or mobile software web applications. 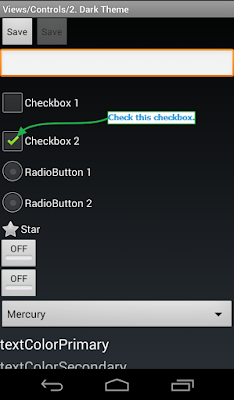 Selecting check box of android software app in appium test is very easy task and I hope, most of you already knows how to select android app's check box in appium automation test but i have to think about bottom level learner who don't know how to select android app's check box in appium automation software test. Let's take very simple example to learn how to select check box in appium. We can use click() method to select check box. Do you wants to learn all appium tutorials? View this LINK. 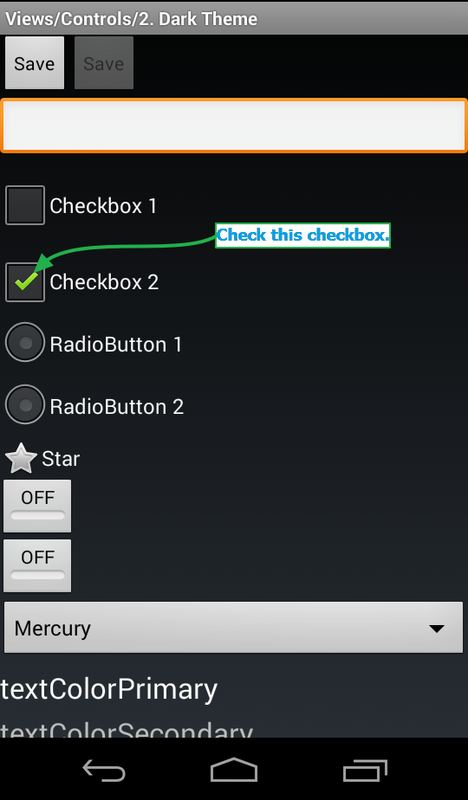 We will use same API Demos software app of android to learn how to select check box of android app as shown in bellow image. Manually you can navigate to above screen from API Demos app's Home -> Views -> Controls -> 2. Dark Theme. Create bellow given test in eclipse and run it using testng and appium. Observe test execution in android device. // Click on check-box to select it. Last syntax in @Test method will select the check box using .click() method when you run software test.